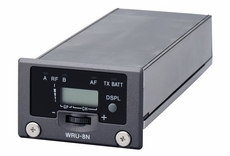 The WRU-8N30/32 tuner unit achieves exceptional standards of RF performance. It features space diversity reception, and a wide dynamic range with low noise and distortion. The MB-8N/9F tuner base and WRU-8N30/32 tuner are ideally suited for a brange of multi channel wireless microphone applications, including broadcast, theater and live production. Up to 4 x WRU-8N30/32 tuners can be installed into the MB-8N/9F tuner base unit. When used in conjunction with the MB-8N/9F tuner base, the WRU-8N30/32 supports remote operation and set-up monitoring over standard Ethernet connections. A complete system can be set up and used as a stand alone wireless microphone system, or as a remotely controlled wireless system from a PC running the GUI software (supplied with MB-8N/9F). UHF-TV channels 30/32 (30,31,32 and 33). Users can choose from 188 frequencies. Compatibiity For use with WL-800 Series wireless products operating within the same frequency block. This modular tuner is compatible with the MB-8N/9F tuner base.